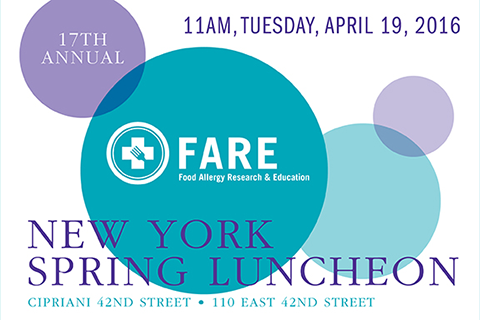 The 17th Annual Spring Luncheon, presented by Food Allergy Research & Education (FARE) @ Cipriani 42nd Street in New York City. 11:00 am Cocktails followed by Luncheon. WABC-TV news anchor Lori Stokes, Stokes hosts. Bag Co-Chairs. Jolie Goldring, Nicole Lenner, Melissa Meyers, Kim Raimondi, and Jennifer Fisherman Ruff are the Raffle Co-Chairs. Support levels are as follows: Tables are available for $15,000, $10,000 and $7,500, and individual tickets are available for $5,000, $2,000, $1,000, and $500. *All proceeds will benefit FARE, a national nonprofit organization with the mission of improving the quality of life and the health of individuals with food allergies, and to provide them hope through the promise of new treatments.